Good news first. I have woken up and feel about 95% better, and the Ming Palace’s bar does a fairly good breakfast menu at a reasonable price. The bad news. The construction sites on my floor and the 4th floor are active, so it gets dusty and loud. My breakfast pancakes had oatmeal in them so sat in my stomach all day, and the shower is by far the worst I’ve ever used in a hostel. The one highlight of my morning was the attentions of the Ming Palace kitten, Ginger – who was sleeping on my lap for a good hour while I stroked him behind the ears. Regardless, the plan was to go to Yanshou tomorrow, so I wanted to look around Guilin today and see what this supposedly stunning-landscape-city had to offer. Needed some directions to get me to the river (honestly, it was literally round the corner in the one direction I HADN’T gone in…), but just took my time to wander down. River is low this time of year, so most of the boats are small bamboo rafts. Also means the river isn’t as pretty as it should be, but did make for a beautiful walk while I made my way down. 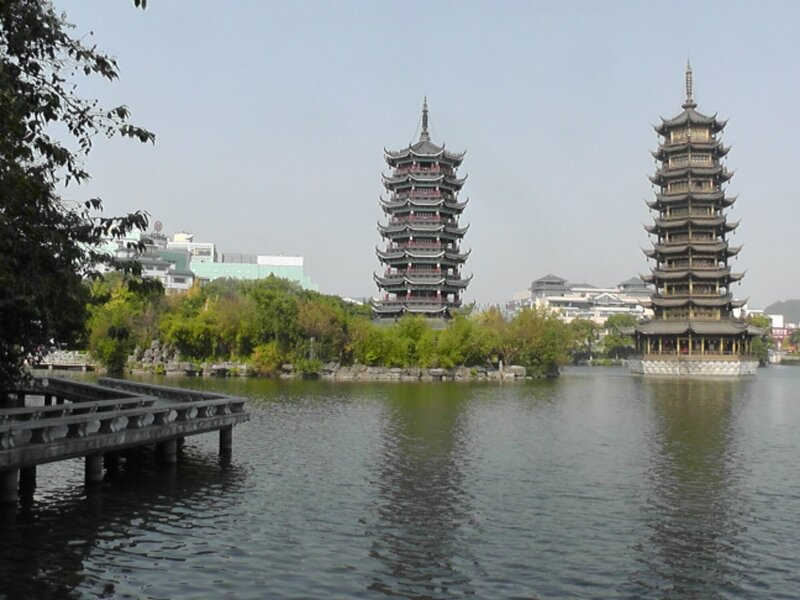 Stopped off momentarily at the Sun and Moon Pagoda’s that were directly opposite in a lake South of my hostel to walk around. This is a beautiful spot, and the Pagoda’s light up at night (though quite costly to get in). I decide I’ll have to come back in the evening to see them, and consider whether or not I want to pay the entry fee to go inside. Finally, I head back onto the river to Elephant Trunk Hill. I’d vaguely heard of this place, but it was supposedly one of the most beautiful spots in Guilin, so I decided to go in. Saw the entry fee and almost legged it. 240RMB! Thankfully on quicker reading that was for a ticket that combined all the areas in Guilin – however this particular park would still cost me 75RMB. Found out later that it was once a mere 15RMB, but they shot the prices up recently. Bitter pill, but decided to go for it anyway. Honestly don’t think it’s worth the price tag, but this is a nice park. 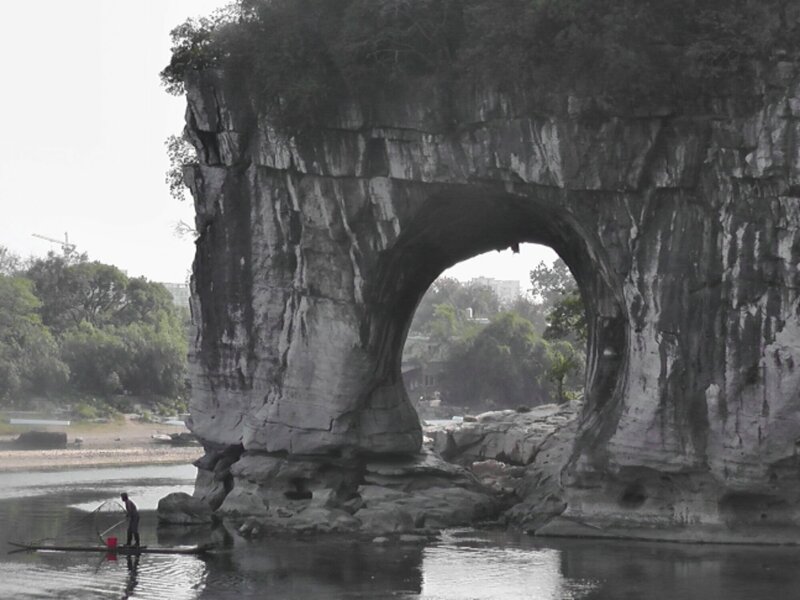 Its named after the strange rock face you see above, which also includes Elephant Eye Cave and Moon Pool Cave (the arch that makes up the trunk). Its a pretty good walk around too, especially the steps up the hill (I might not be training but between this and the Great Wall I’m really going to get some improvement in my snap kicks). My only issue is that is was so misty-stroke-foggy that you couldn’t see much view wise. The park also has a legend to do with an elephant, and believe there’s a show that tells it, but couldn’t find any information on this in English so decided to leave without further investigation – think it happens at night anyway. Walked back the way I came, and headed towards the other famous park in Guilin, Seven Stars. However, that had an equally expensive price tag, and even worse: to get into the two main attractions of said park (the cave and the zoo) you had to pay an additional 40-60RMB. I want to see if this is worth it before I pay up so head back to the hostel and bring up Trip Advisor. Enough negative reviews convince me that it won’t be worth it, but am interested in a popular attraction called Reed Flute Cave. Its a bus ride out, which is a bit of a problem since the bus is my most loathed form of travel, especially in foreign countries. To help out, the front desk writes down where I need to go in Chinese, so I can confirm with the driver before I get on. Also sells me a discounted ticket which is (again) 75RMB instead of 90. 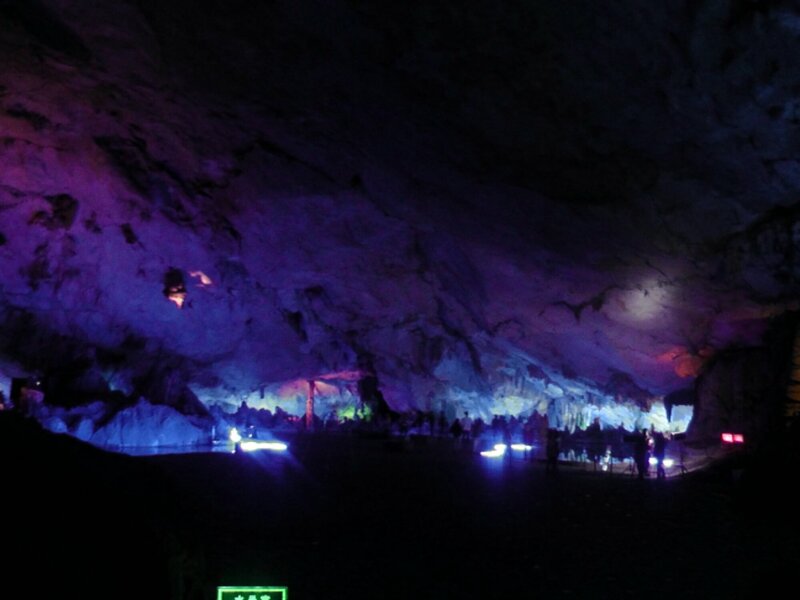 Reed Flute Cave is pretty far out from Guilin, so its a bit of a trip. 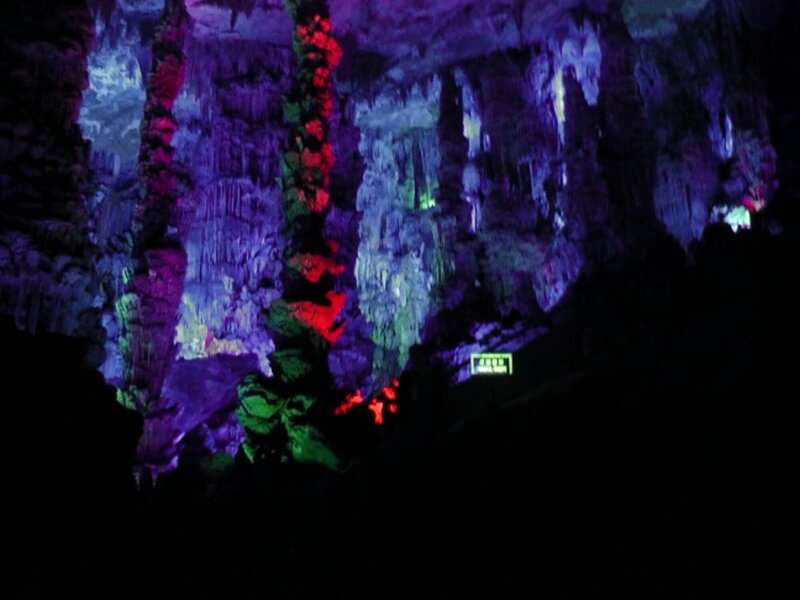 Its essentially a cave that has formed beautiful and unique rock formations over the years, and Guilin has added colourful lights to showcase the most interesting. When I arrived, I was 40 minutes too late for the English tour (of which there are only 2, 10:30 and 15:00), so tagged along with a Chinese group. This was for my own benefit since the lights in the cave are programmed to turn on when activated by the guides torch. No torch, and you’re basically walking around in darkness. FINALLY, something in Guilin that seemed worth its ticket price. These caves are incredible. I didn’t understand a word the guide was saying, but each area had an English description stating what it supposedly looked like. It was kind of fun to guess the answer before reading, though really hard to get right a lot of the time. Still trying to wrap my head around the fairyland one though. It was a very beautiful place, if slightly manufactured due to the odd coloured lights, and definitely worth visiting. The only major issue I found was taking photographs – its dark and the neon makes certain cameras (mine especially) pretty useless. I was pining for my former tour mates monster machines. When it was time to leave, I found myself with 2 problems. One – I had no idea where to catch the bus back, and two – I’d used my last 1 yuan getting here and needed exact change. Had tried to explain that to the shopkeeper but it really didn’t work out. Instead, walked along and looked for people with bags and brightly coloured trinkets. Sure enough, got a woman selling postcards on my back within a few metres of leaving the caves. Its a multi-pack and about half of them are actually decent, so could definitely use them. Haggle her down to a change-creating price (though I was so desperate for the notes that about 30 seconds after buying, realised I could have probably gotten them a for a few yuan less than I did). As for the bus stop, I did my tried and tested student walking home technique. Just keep walking along the road until you come across one. Probably should have moved forward instead of backwards considering it took a good ten minutes to get to the first stop, but at least I found it. When I get back, its back to the Ming Palace’s bar, where I play with Ginger for a bit, and have some stir fried vegetables for dinner. Still not ready to try heavy solids just yet – were very good though. Definitely onto actual menu foods soon. Considered going out to see the pagodas, but planned on getting up early so figured staying in would be best. 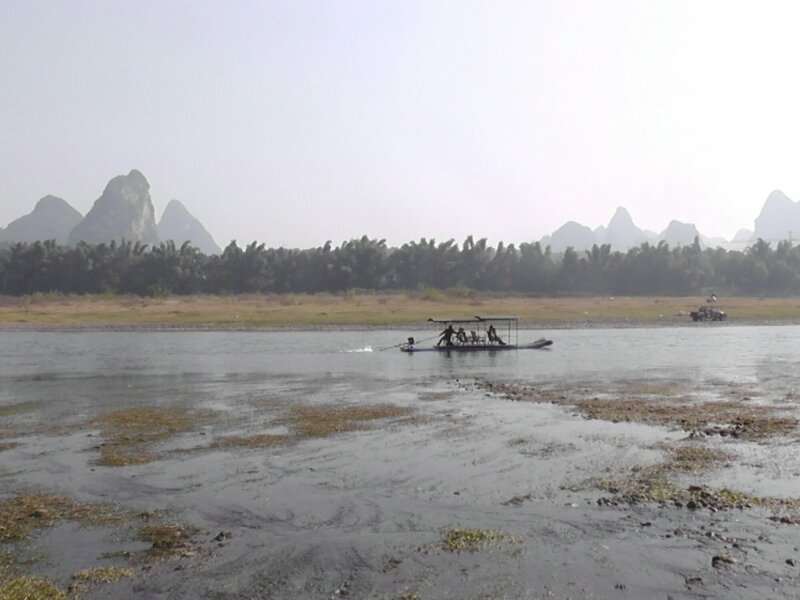 I’d been researching Yangshou throughout the day – the best option (a large boat cruise) wasn’t running as the river was low, so I could go by bamboo raft…only the tour I’d found didn’t leave until 10, and got you into Yangshou at 3. I wanted to explore Yangshou and that didn’t seem enough time. 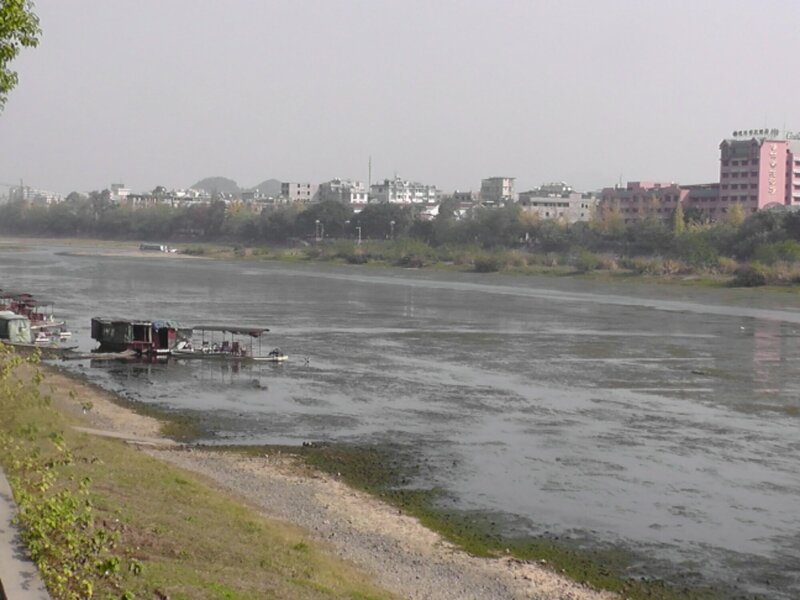 Instead, I’d seen online that buses to and from Guilin were fairly cheap, and didn’t take too long. As such, figured it would be best to get a bus into Yangshou, and explore it at my leisure. As such, stayed in my room and called it a night. This entry was posted in China, Diary and tagged China, Elephant Trunk Hill, Guilin, Ming Palace International Youth Hostel, Reed Flute Cave, Sun and Moon Pagodas. Bookmark the permalink.